1. 'The Mahabharat is mythological', said Gandhi! Gandhi's picture where he is dressed in a loincloth, with a copy of the Bhagwad Gita at his side - is a common sight throughout India . Gandhi did not accept Sri Krishna as God, but as a man with exceptional qualities. In the Eleventh Chapter of Gita, it is said that Lord Krishna shows His formidable form to Arjuna. According to Gandhi this chapter was interpolated, meaning that it was not there in the original Gita and that someone appended it later. The same Gandhi, it is said, discovered 'Yoga of non-attachment' from the same Bhagwad Gita! It is said that he discovered Satyagraha from Gita as well! 2. Gandhi said, 'Idols of Deities do not have any powers'! His words are - 'The belief in the curative powers of idols is dangerous' (Truth Vol. I P, 359) Understand how dangerous is Gandhi himself. We should pity Gandhi. 3. Gandhi - Destroyer of Hindu traditions! Gandhi used to say, 'A pure hearted person can explain the true meaning of our Scriptures!' On this premise he destroyed Hindu Traditions. This is Gandhi's explanation! In his commentary the Dutch missionary Elst writes, 'The theologians versed in Sanskrit grammar and scriptures are not the best guides to interpret the text? What right did Gandhi have in asking Hindus to behave against the Scriptures? 4. Gandhi, Nehru and their Congress - responsible for Atheist Hindus! It is because of Gandhi, Nehru and their Congress that secularism was fabricated and God and righteousness were thrown out of our Constitution and Governance. The atheist attitude seeped into every sector all over the country. 5. Gandhi opposed Science and the Hindu religion! 6. Gandhi read the Koran in a Hindu Temple ! The atrocious oppression of Hindus in Naukhali during the rule of (the then Chief Minister of Bengal ) Surawardy in mid 1946 made our blood boil. And when Gandhi sided with the same Surawardy and addressed him as 'Shahid Saheb' (a martyr) later in his prayer meetings, our shame and anger knew no bounds. When Gandhi went to Delhi he held his prayer meetings in a temple in the sweepers colony. Ignoring the protests of the priest he insisted on reading a passage of the Koran as part of the prayer meeting. It was easy for him to trample upon the feelings of the tolerant Hindus. Gandhi's policy of Muslim appeasement can be easily seen by his love for Urdu. Gandhi took the initiative to "father" a new language called as "Hindustani"(Urdu). First he announced his intentions of spreading "Hindi". Then began his rattle of "Hindi and Hindustani" being one and the same. Everyone then knew that there isn't any such language called "Hindustani". That so called language had neither any grammar nor vocabulary! It was nothing but a local spoken language, a child of Hindi and Urdu. 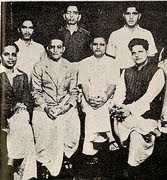 Gandhi urged that Hindustani be the National Language of Hindusthan. Owing to the strange language, verbal perversions like "Badshah Ram", "Begum Seeta" and "Ustad Vasisht" began to get propagated and Gandhi surprisingly encouraged them. Then began Gandhi's encouragement to learn Urdu, as Hindusthani and Urdu were only "slightly" different. Unfortunately for Gandhi and his secularist gang, the Hindu Populace still had strong sentiments for Sanskrit and the Hindi Parishad marked Gandhi's doom as a linguistic politician, wherein he had to resign. Gandhi has destroyed pure Sanskritnist Hindi to a great extent. Most of the media use too many Urdu words in Hindi. It is hard to listen pure Hindi in Bhaarat. Acharya Vinobha Bhave, the first Satyaagrahi (unfortunately), read out the Kuraane Shareef at the function organized in Nagpur Chatralaya. This news had been published in the newspaper "Independent". Mohandas Karamchand Gandhi was in fact a Duratma [evil person] and not a Mahatma [great/holy person].A Mahatma treats everybody equal but he did not. He treated Muslims better and absolutely ignored their evil actions not only in India but all over the world. SO HE WAS NOT A MAHATMA. He poisoned the minds of Hindus and Hindu Temples by slogan of Ishwar Allah Tero naam but this slogan was not adopted by Muslims and their leaders. Gandhi claimed to have throughly read Bible and Quaran but failed to understand the Christians and Muslim minds and their evil deeds. A day is fast approaching near when his cremation spot at Rajghat, New Delhi will be uprooted and only then new India , a strong India will rise. India would have been far better off without Gandhis and Nehrus. They are like Rahu and Ketu and these demons must be destroyed by whatever means possible because they are viruses of worst kind.